This report was planned in the wake of the refugee crisis and aims at assessing to what extent national systems are able to respond to the needs of asylum seekers and refugees in higher education. While there is a strong potential demand for higher education among refugees and many have previously been enrolled in university programmes in their home country, it cannot be taken for granted that this demand is easily met. 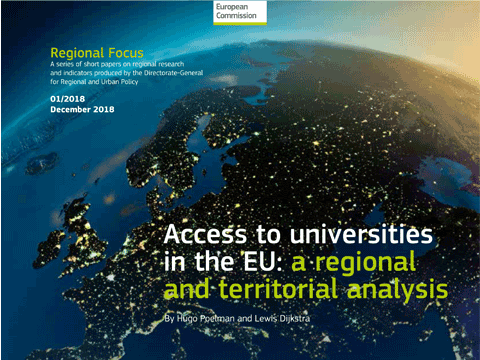 This regional focus shows the regions and areas that have good access to a university and those that do not. It uses data on the location of all universities, population grid statistics and the road network to measure the number of people who live more than a 45-minute drive from a university. Convenient access to higher education can be an important asset for regional development and competitiveness. It can boost innovation and upgrade the skills of the labour force through education and lifelong learning. Widespread access will allow more people to attend university, including those who cannot afford to move to get a degree. Is there anywhere in Europe where students can study without paying fees? Which countries charge the highest fees? What kind of financial support is offered to students, and who actually receives it? When students plan for higher education, one important element to consider is how much it will cost and whether they can receive any financial support. Reliable information on the costs and available student support in higher education is essential. This latest Bologna Process Implementation Report presents a wide-ranging and detailed picture on how the European Higher Education Area(EHEA) has been moving forward since the Yerevan Conference in 2015. It follows the two previous Bologna Process Implementation Reports (2012 and 2015). In particular, the report explores the evolution of the key policy areas identified by Higher Education Ministers in the Yerevan Communiqué of 2015. It does this through its seven chapters: The European Higher Education Area Landscape; Learning and Teaching; Degrees and Qualifications; Quality Assurance and Recognition; Opening Higher Education to a Diverse Student Population; Relevance of the Outcomes and Employability; Internationalisation and Mobility.